When it comes to the knitting world, "frog" is one of my new favorite words. Frogging is when you rip out the knitting because it didn't go as planned, you made a mistake or you find a Goodwill sweater made of yarn that you must have. Rip it, rip it ... ribbit, ribbit ... get it? This was the fate of my first washcloth. 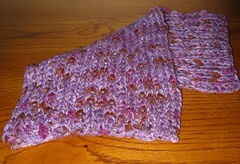 The yarn was wonderful but the pattern and resulting width just did not work out. It was an experiment from the beginning because when you work with a knitting loom, it's difficult to determine the finished size. Well, unless you make a gauge swatch and I just don't have the patience for those (which resulted in mitten disaster '09 but that's another story). Back to the washcloth. I used 36 pegs on the yellow Knifty Knitter long loom. 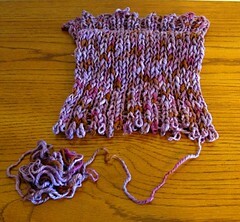 With double-knitting, I did 10 rows of ribbing, knit in stockinette for awhile and then switched back to ribbing. 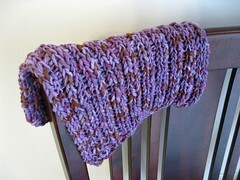 The ribbing was barely noticeable and the washcloth was just too skinny. I let it go for awhile and went back to it recently. Check out my resulting pattern!